The trituration of olives in Morocco is ensured by a different system of extraction. Traditional units triturate approximately 30% of the national production, whereas the 70% are treated by semi-modern units using super-presses and industrial units employing the continuous system two-phase and three-phase. The physicochemical characterization of the pomace obtained from different extraction systems has revealed a high moisture content, a slightly acid pH (5.9 - 6.04) and a high content of organic matter (74.69% to 92.03%). The pomace studied is rich in nutrients important for the growth and development of plants. In effect, it is rich in potassium, carbon, and oligo-elements. However, these properties are compatible with the requirements of the agriculture of several plants, reason for which this pomace can be considered as a soil amendment especially those that are poor in organic matter, namely the Mediterranean soils. Olive pomace, Agrochemical characterization, Organic amendment. The olivier is a mediterranean culture, which adapts well to Moroccan climatic conditions, of this fact it occupies a large surface of the national territory. It stretches over an area of approximately 620.000 ha (220.000 ha are irrigated, 150.000 ha non-irrigated and 250.000 ha in mountains) . The production of olives is approximately 630.000 tons, of which 400000 tonnes is oriented for the production of olive oil . The importance of the olive tree in Morocco is capital on the economic, social and environmental benefits. Indeed, it contributes to ensuring multiple functions, such as the fight against erosion, the valorization of agricultural land and the immobilization of the population in the rural areas. The national olive cultivation allows supplying 260 industrial units and more than 16000 traditional units, called maâsras . - 40 Kg of pomace, if we use the traditional system . - 55 Kg of pomace, if we use the three phases continuous system . - 70 Kg of pomace, if we use the two phases continuous system . The valuation and the treatment of sub-olive products present a challenge downstream of the pipeline. In fact, the rejection of these sub-products pollutes and strongly degrades the natural environment. The objective of the present study is the qualitative characterization of olive pomace, obtained by different systems of extraction, in order to assess their agronomic exploitation. - The first unit is a system of the traditional press, based on manual pressing of the paste in the pressing mats, and the natural separation of the oil from the vegetation water by decantation. - The second and the third units are continuous extraction systems of two-phase and three-phase based on the separtion by centrifuges. 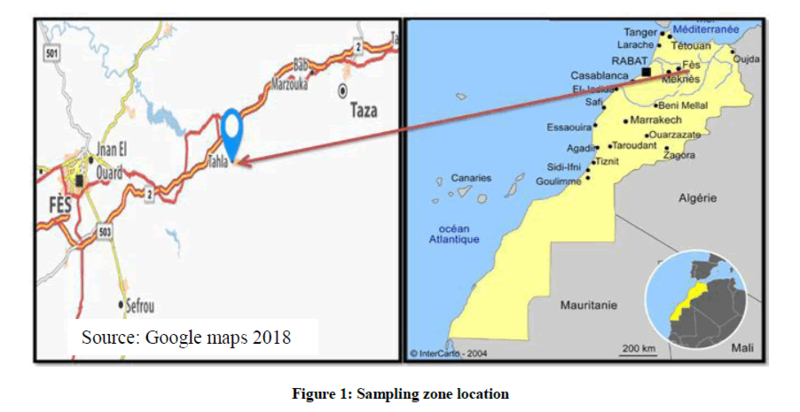 The triturated olives are originating from the commune of Tahla, located in the region Fès-Meknès (Figure 1). The pressing in Tahla is mostly traditional. In effect, the region has six traditional units, one two-phase unit and one three-phase unit. The vegetation water generated is discharged directly into the natural environment, while the pomace is sold to traditional ovens for baking bread. The extraction of olive oil involves different processes, such as the receipt of olives, washing, crushing, mixing, and clarification of oil. The quantity and the physicochemical properties of the waste and effluents generated depend strongly on the extraction method used: traditional, two-phase or three-phase (Figure 2) . The three-phase system generates a large volume of waste water, which is practically equal to the quantity of olives pressed . By against the two-phase system generates little waste water, but pomace moisture obtained is relatively high . 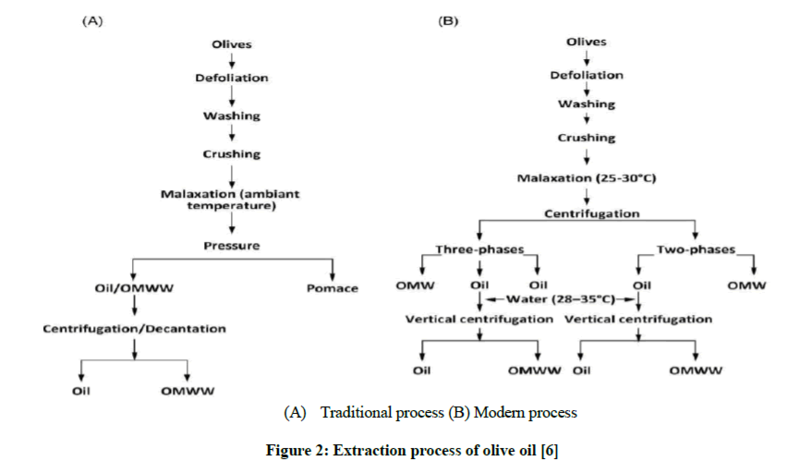 To perform the physicochemical characterization of olive pomace, a representative sample from the three systems of extraction is dried in the drying oven at 60°C, crushed and sieved to 0.1 mm to determine pH, electrical conductivity (EC), micro and macronutrients. The moisture content is determined by drying the sample to 105°C until constant weight . For the organic matter, a dried sample in the oven is burned at 525°C during 3 h . The pH and the EC are measured in the aqueous extract using the ratio 2:5 (w/v) for pH , and the ratio 1:5 (w/v), for EC . The total nitrogen is measured by Kjeldahl method , the total organic carbon by Anne method 1945 . The macro and microelements (P2O5, K2O, Ca, Mg, Na, Ni, Fe, Cu, Mn, Zn, Cr) are determined by atomic absorption spectrometry, in the environmental laboratory of the National Institute of Agronomic Research. 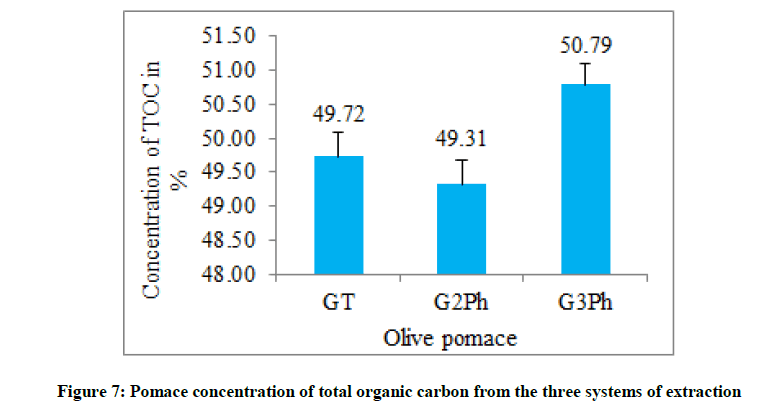 The pomace studied have a little acid pH which varies from 5.9 for the residue of the two phases (G2Ph) and three phases (G3Ph) systems to 6.04 for pomace of the traditional system (GT) (Figure 3). As a soil amendment, this pH is favorable for assimilation of nitrogen, phosphorus, and potassium, necessary for the development of the plants . Also, the development of bacteria and fungi responsible for organic matter degradation is ensured, for pH values near to neutrality (6 to 8) or slightly acidic . 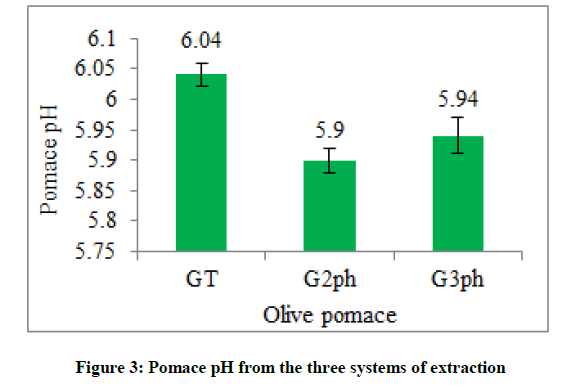 The same pH value of pomace (pH=6.6) is observed in an Italian study . 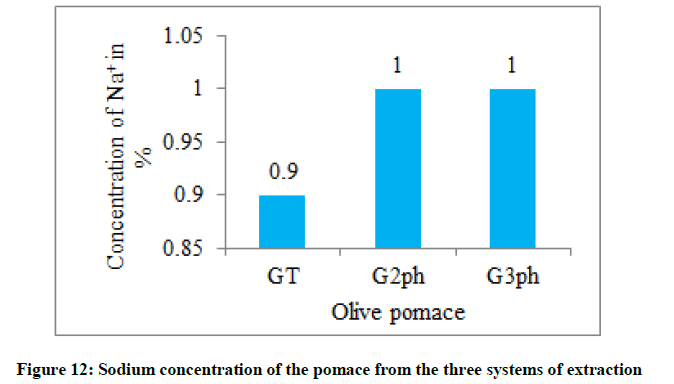 The variation of pomace pH is a function of several parameters, such as the variety of olives, the maturity stage and the storage duration of olives . The electrical conductivity of pomace varies from 2.4 to 3.2 ms/cm. These values are considered tolerable for their agronomic use, according to the Moroccan standard of organic fertilizer . A comparable value of 2.6 ms/cm has been observed in an Italian study conducted by Proietti et al. . 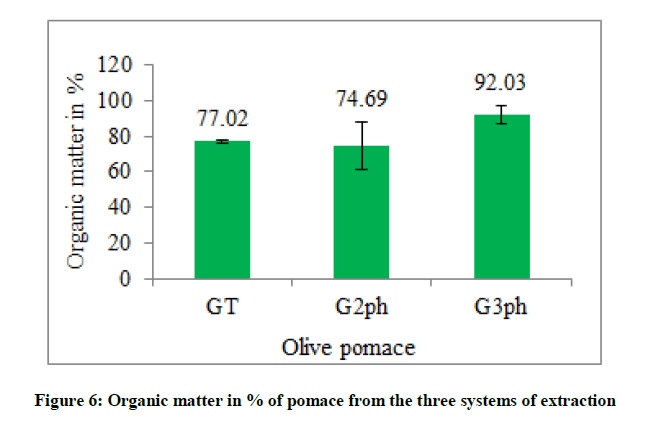 The increase in pomace electrical conductivity is often linked to salts used to preserve the olives quality during storage (Figure 4) . The pomace water content remains on average higher than 40%, with a minimum of 43% observed for pomace of the traditional system and a maximum of 72.8% for pomace of the two-phase system. This characteristic of water retention allows conserving soil moisture and slowing down the soil dryness. Indeed Kavdir and Killi  have shown that the distribution of pomace on soil improves its structure, its stability, and its water retention capacity. This water content variation is strictly linked to the extraction process. In effect, the two-phase extraction system (G2Ph) generates too wet pomace compared to traditional extraction system (GT) and three-phase extraction system (G3Ph) (Figure 5) . The present pomace is rich in organic matter which varies from 74% to 92%, of this fact they could constitute a good amendment for soils poor in organic matter. In addition, the richness of the soil of organic matter increases their overall stability , which makes them less sensitive to erosion (Figure 6). From the point of view macronutrients concentration (P2O5, K2O, Ca, Mg, Na), the analyzed residue present a significant variation for the different systems of extraction. The organic carbon remains little variable and has values of 49.31% to 50.79%. These values are similar to the one observed in Portugal (53.51%)  and in Italy (52.43%) . In term of using pomace as an amendment, this high concentration in organic carbon will enrich the soil reserves of carbon. Indeed an experience conducted in Portugal  has demonstrated a significant increase in the amount of organic carbon in soil treated for three years with pomace from the two-phase system (Figure 7). 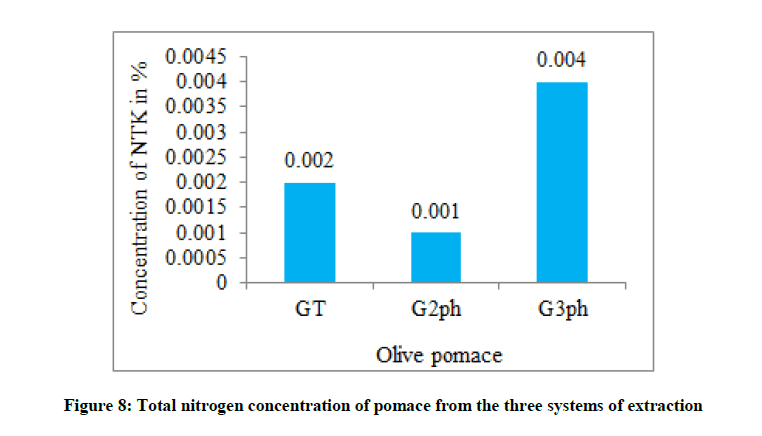 The pomace studied have a low total nitrogen concentration (Figure 8), which varies from 0.002% for pomace of the traditional system (GT) to 0.001% for pomace of the two-phase system (G2Ph) and 0.004% for pomace of the three-phase system (G3Ph). Higher concentrations (1%) are observed in a study conducted in Tunisia . However, Brunetti et al. have demonstrated that application of olive pomace for two years, has led to an increase of total nitrogen in the soil, which allows saying that pomace can improve in the long term the chemical characteristics of the soil. 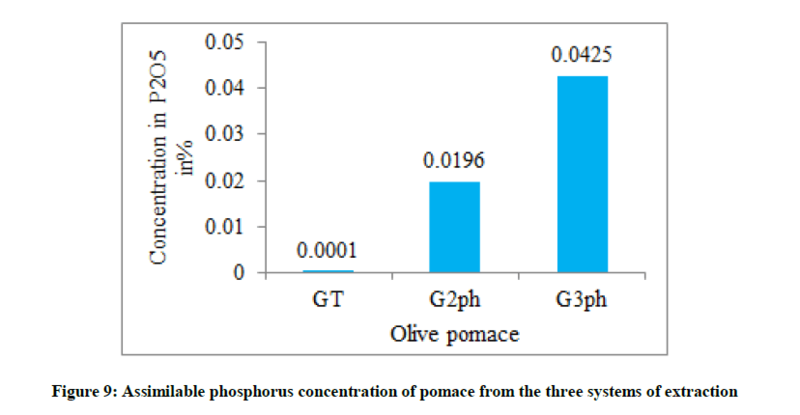 The concentration of assimilable phosphorus is higher for pomace of three-phase system 0.0425% and two-phase system 0.0196%, than that of traditional system 0.0001% (Figure 9). Concentrations of total phosphorus of 0.12% and 0.27% are found successively in Italy  and in Portugal . In effect when an amendment is applied to soil, an increase in the content of available phosphorus is planned, as the main result of soil fertility improvement, something which was observed in Spain [24,25] follows to the use of pomace as a soil amendment. The increase in available phosphorus in soils amended by pomace is due to phospho-humic complex, which avoids insolubilisation of phosphorus especially in calcareous soils . 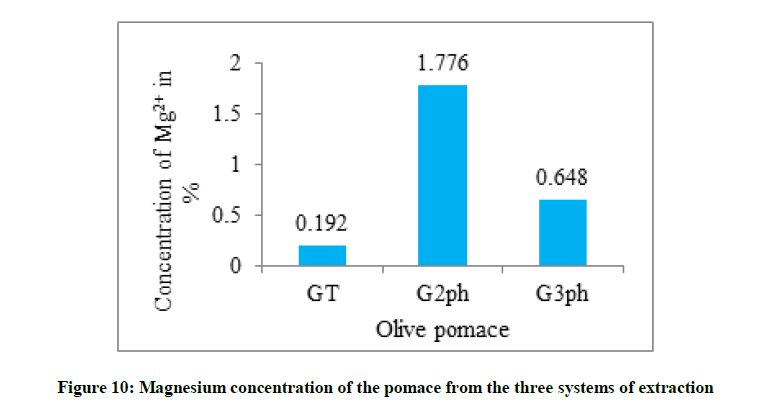 The magnesium concentration is important for pomace of two-phase system (1.776%) compared to that of three-phase (0.648%) and traditional (0.192%) systems (Figure 10). The below values 0.31%, 0.18% have been observed successively in Spain  and in Portugal , for pomace of the tow-phase system. 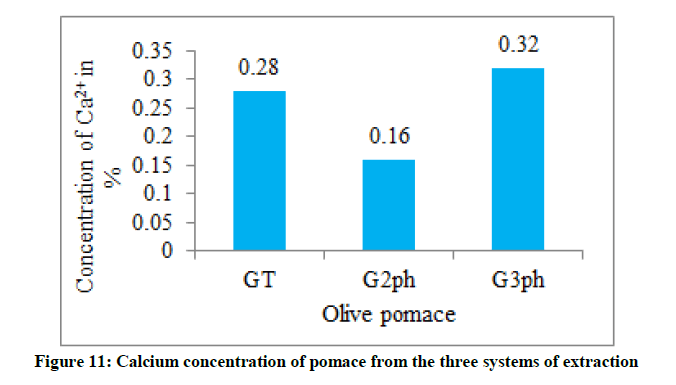 By against the calcium concentration was almost similar for the three systems of extraction (Figure 11) which vary from 0.28% for pomace of the traditional system, to 0.16% for pomace of the two-phase system and 0.32% for pomace of the three-phase system. 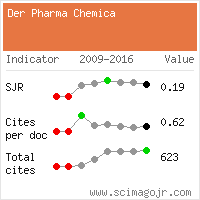 These concentrations remain close to the values found in a study conducted in Portugal (0.68%)  and in Spain (0.8%) . The concentration of sodium which is equal to 0.9% for the traditional system and 1% for the other two systems of extraction remains relatively high compared to the value found in Spain  which is 0.31% for pomace from the two-phase system (Figure 12). The presence of magnesium, calcium, and sodium in the soil presents an important intake nutrient for the plant. However, the different pomace samples have been poor in phosphorus and calcium, and rich in magnesium compared to composts of municipal solid waste , although similar in assimilable phosphorus by the report to the sludge of STEP . The present olive pomace shows a large amount of potassium salts (Figure 13). In effect, the concentration of this element for the two-phase, three-phase, and traditional systems is respectively 4.6%, 9.4% and 6.7%, which is substantially higher than the value obtained in Portugal (1.5%)  and that found in Italy (1.7%) . In this regard, the amendment of soils by pomace seems able to enrich the soil with exchangeable potassium. In fact, a study conducted in Italy has shown an increase in the exchangeable potassium 4.9 times more for a soil amended by the pomace, by the report to the witness, after 3 years of amendment . On the other hand, a good fertilization in potassium allows a better tolerance to drought, which is very common in the Mediterranean conditions . The oligo-elements are active in very small quantities and enter in the activation of many enzymatic complex. 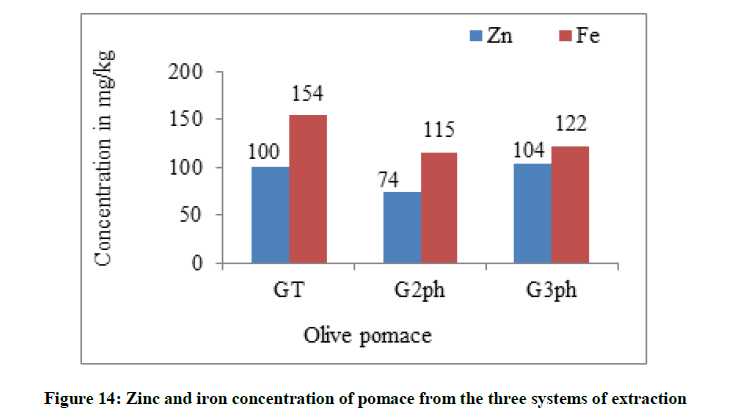 Pomace of the three system of extraction has elevated levels of zinc that vary from 100 mg/kg for the traditional system, 74 mg/kg for the two-phase system, and 104 mg/kg for the three-phase system (Figure 14). The iron concentration is greater for pomace of the traditional system (154 mg/kg) than that of the two-phase and three-phase systems in which the successive concentration is 115 g/kg and 122 mg/kg (Figure 14). Higher levels of iron (614 mg/kg) and lowest in zinc (21 mg/kg) have been observed in Spain . 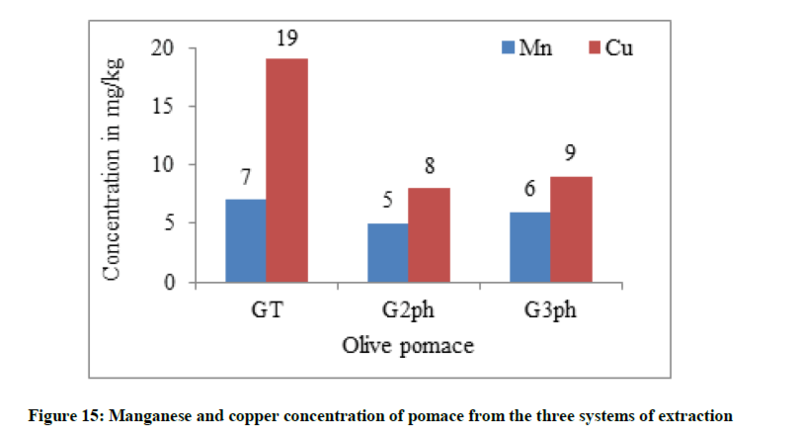 The concentration of manganese is almost identical to pomace of the three systems of extraction and which remains less than the value (56 mg/kg) were found in Spain  (Figure 15). However, the copper content is 19 mg/kg for pomace of the traditional system, close to the value 17 mg/kg found in Spain , and lower than the values found for pomace of the two-phase (8 mg/kg) and three-phase (9 mg/kg) systems (Figure 15). In general, the concentrations of these nutrients (Zn, Fe, Mn, Cu) is low compared to that found in other materials used as a fertilizer or as a soil amendment (compost of urban waste and mud of STEP), [28,29]. 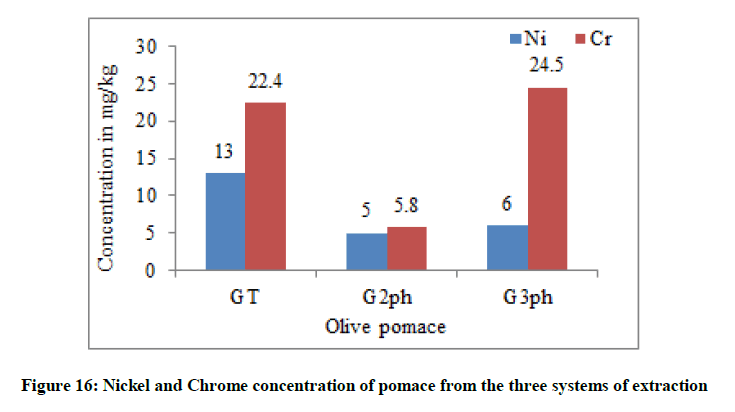 The concentration of chrome is variable in pomace of the different systems of extraction (Figure 16). It is 22.4 mg/kg for pomace of the traditional system, 5.8 mg/kg for pomace of the two-phase system and 24.5 mg/kg for that of the three-phase system. A value of 15 mg/kg has been observed in Italy . The chrome and more particularly the Cr(VI) is a very toxic element. This toxicity has been demonstrated at different stages of growth and development of plants . The nickel content is particularly high in pomace of the traditional system (13 mg/kg) and almost identical for the two-phase (5 mg/kg) and three-phase (6 mg/kg) continuous system (Figure 16). A value higher (55 mg/kg) has been observed in Spain . However, a concentration nickel of 0.1 mg/kg seems to have a beneficial effect on the growth of the roots isolated from L. leucocephala, a depressive effect for the same plant, from the concentration of 1 mg/kg, and a deadly effect for a concentration of 10 mg/kg . Despite the high concentration in chrome and nickel, it remains lower than the regulatory thresholds set by the standard NFU 44-051 relating to organic amendments . Has to note that the variation of the chemical composition in macronutrients and micronutrients of pomace from the three systems of extractions, depends on several factors, namely, the variety of olives, the stage of maturity, the age of olivier, the physicochemical characteristics of the soil and the extraction process . Several studies have been carried out the world to demonstrate the agrochemical quality of olive pomace. Indeed, an experiment realized in central Italy, which consists of disseminating large quantities of olive pomace (50 t/ha) for four consecutive years, has shown an increase in the content of organic matter, total nitrogen, exchangeable potassium, magnesium and assimilable phosphorus without changing the soil pH . In another Italian study Brunetti et al. found that the application of pomace for two years led to a significant increase in total soil nitrogen. This result is in line with those obtained by other studies carried out in Spain [25,35]. Olive pomace always contains a large amount of potassium salts. Therefore, an increase in potassium content is expected in the soils amended by this pomace. Indeed, an Italian study conducted by Proietti et al. showed a 4.9 fold increase in exchangeable potassium compared to the control after 3 years of treatment with olive pomace. 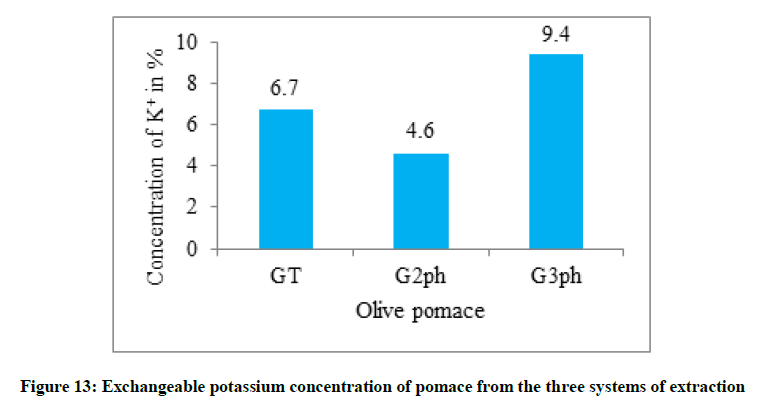 Significant increases in soil available P was also found when pomaces are used as soil amendments. [21,24,25]. The increase in macro-elements in soils treated with pomace confirms that the latter could be used as an alternative source of major growth element for the plant instead of using chemical fertilizers that harm the environment. The results of the physicochemical characterization show that pomace studied has a low pH acid, a high content of organic matter and moisture. They are rich in potassium, in organic carbon and magnesium, and slightly poor in phosphorus, calcium, and nitrogen. In term of oligo-elements, the pomace studied is poor in iron, it presents moderate concentrations of copper, zinc, and manganese. Of this fact, we can say that the richness of that pomace in organic matter and minerals elements, associated with the faculty of the soil to degrade and to digest the organic matter on the one hand, and to the capacity of plants to exhaust in the soil the nutrients they need, on the other hand, encourage the use of that pomace as soil amendment. Also, good agronomic use of pomace allows increasing the chemical fertility of soil, while saving the high cost of nitrogen, phosphorus and potassic fertilizer. Ahmidou, Ouaouich; Hammadi, Chimi, Guide du producteur de l’huile d’olive. Vienne : Organisation des Nations Unies pour le développement industriel, 2007, 36 p.
Chemonics International, Guide de bonnes pratiques de fabrication des huiles d’olive. L’Agence Américaine pour le Développement International, 2006, 31p. A. Ait Hmida, Diagnostic du secteur de trituration des olives au Maroc, New Medit., 2002, 1, 1, Pp: 12­16. Centre d’activités régionales pour la production propre (CAR/PP), Plan d’action pour la Méditerranée. Prévention de la pollution dans la production d’huile d’olive, 2000, 140p. C. Peri, P. Proietti, Olive mill waste and by-products, In: C. Peri, (Edi. ), The extra-virgin olive oil handbook. John Wiley & Sons, Ltd, Oxford, 2014, 283-302. C.M. Ganlanakis, Olive Mill Waste, Recent Advances for Sustainable Management, Galanakis Laboratories, Chania, Greece: Academic press, 2017, 300p. H. Chimi, Transf. Technol. Agri., 2006, 6, 69-76. J. Rodier, B. Legube, N. Merlet, L’Analyse de l’eau, 9th (Edn. ), Dunod, Paris, 2009, Pp: 1511. ISO 11265, Qualité du sol - Détermination de la conductivité électrique spécifique, Octobre 1994. J.M. Bremner, C.S. Mulvaney, Nitrogen-Total, In: Methods of soil analysis, part 2, A.L. Page, (Eds. ), Agronomy Monog, 9 ASA and SSSA, Madison, WI, 1982, Pp: 595-624. M. Bonneau, B. Souchier, Constituants et propriétés du sol, 2nd (Edn. ), Masson, Paris, Milan, Barcelone, 1994, 618-653. A. Nefzaoui, Valuation of lignocellulosic residues in the diet of ruminants by treatment with alkali, Application to pomace oil, Catholic University of Leuven, 1985, Pp: 345. Z. Mennane, S. Tada, I. Aki, M. Faid, S. Hassani, S. Salmaoui, Technol. Laborat., 2010, 5, 4-9. L. Nasini, G. Gigliotti, M.A. Balduccini, E. Federici, G. Cenci, P. Proietti,. Effect of solid olive-mill waste amendment on soil fertility and olive (Olea europaea L.) tree activity. Agric. Ecosyst. Environ., 2013, 164, 292-297. H. Chimi, PNTTA's Monthly Newsletter and Liaison., 2001, 79, 1-4. S. Brahim, Transf. Technol. Agri., 2005, 6p. P. Proietti, E. Federici, L. Fidati, S. Scargetta, L. Massaccesi, L. Nasini, L. Regni, A. Ricci, G. Cenci, G. Gigliotti, Agric. Ecosyst. Environ., 2015, 207, 51-60. Y. Kavdir, D. Killi, Bioresour. Technol., 2007, 99, 2326-2332. A. Lopez-Pineiro, S. Murillo, C. Barreto, A. Munoz, J.M. Rato, A. Albarran, A. Garcia, Sci. Total Environ., 2007, 378(1-2), 84-89. A. Lopez-Pineiro, J. Fernandez, R. Nunes, J. Manuel, A. Garcia Navarro, Soil Sci., 2006, 171, 728-736. A. Lopez-Pineiro, A. Albarran, J.M. Rato Nunes, C. Barreto, Bioresour. Technol., 2008, 99, 7982-7987. Y. M'sadak, M. Makhlouf, S. El amrouni, J. New Sci. Agri. Biotechnol., 2015, 18(4), 668-678. G. Brunetti, C. Plaza, N. Senesi, J. Agric. 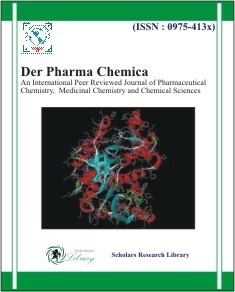 Food Chem., 2005, 53, 6730-6737. C. Paredes, J. Cegarra, M.P. Bernal, A. Roig, Environ. Int., 2005, 31(2), 305-312. E. Madejon, P. Burgos, R. Lopez, F. Cabrera, Nutr. Cycl. Agroecosyst., 2003, 65, 281-288. P.L. Giusquiani, M. Pagliai, G. Gigliotti, D. Businelli, A. Benetti, J. Environ. Qual., 1995, 24, 175-182. G. Tortosa, J.A. Alburquerque, G.A. Baddi, J. Cegarra, J. Cleaner. Production., 2012, 26, 48-55. N. Hafid, M. El Hadek, A. Lguirati, A. Bouamrane, French Rev. Indus. Ecol., 2002, 25, 13-17. H. Kassaoui, M. Lebkiri, A. Lebkiri, E.H. Rifi, A. Badoc, A. Douira, Bull. Soc. Pharm. Bordeaux., 2009, 148, 77-92. J.A. Alburquerque, J. Gonzalvez, D. Garcıa, J. Cegarra, Bioresource. Technol., 2004, 91, 195-200. A.K. Shanker, C. Cervantes, H. Loza Tavera, S. Avudainayagam, Environ. Int., 31, 2005, 739-753. G.Verlière, R. Heller, Physiol. Vig., 1981, 19(2), 263-275. Norme NF U44-051, Amendements organiques, Avril, 2006. J. Irvine, Sugarcane. In: Symposium on potential productivity of field crops under different environments. Los Baños, Philippines, IRRI, 1983, p. 361-381. F. Montemurro, G. Convertini, D. Ferri, Agronomie., 2004, 24, 481-486.